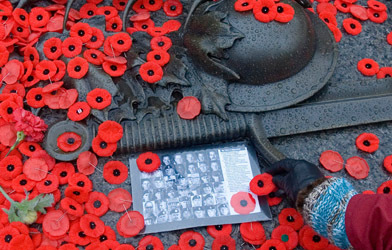 Every year in October and November paper poppies decorate the lapels and collars of the entire Canadian population. Since 1921, the poppy has been the symbol of remembrance and the visual sign of the conviction of never wanting to forget that, for our freedom, Canadian soldiers fell during the Second World War. The poppy is also an international symbol of remembrance and has been adopted by many other countries to honour those who have made the ultimate sacrifice for the restoration of freedom. In the Netherlands RCL Branch 005 organizes an annual poppy campaign with the help of many volunteers. Once started in 2004 with the inhabitants of Apeldoorn, more municipalities were added to the campaign in the course of the years such as, Zandvoort (2005), Heemstede (2007), and from 2008 onwards Bloemendaal, Hillegom and Veendam. Furthermore just recently the town of Brunssum (South Limburg) has started working on a poppy campaign. A link between war and the poppy has been known for centuries. Even during the Napoleonic wars it was already noticed, how easily poppies grew on the graves of fallen soldiers in Flanders. During the First World War, it was in Ypres (Flanders), that after the second most disastrous battle in 1915, when the Germans for the first time used chlorine gas, that the poppies began to flourish in abundance. Due to the high death toll the ground was saturated with blood. Furthermore the ground was so heavily ploughed under that the slumbering poppy seeds suddenly came to germination. Veterans from the First World War assumed that the red colour of the poppy was created by the blood of the mortally wounded. The person who more than anyone else was responsible for the adoption of the poppy as a symbol of remembrance in Canada, was Lieutenant-Colonel John McCrae, physician of the Commonwealth countries during the First World War. Lieutenant-Colonel John Mc Crae (1872-1919), born on 30th November 1872 in Guelph Ontario (Canada), a physician served for two and a half years in the trenches of Ypres. From 22 April 1915, he experienced the most horrific massacres, including the death of his best friend. The day after the death of his friend, Lt Alexis Helmer from Ottawa, John McCrae fled his bunker for a breath of fresh air. In his hand he carried a piece of paper with on it hastily written a mere 15 lines. 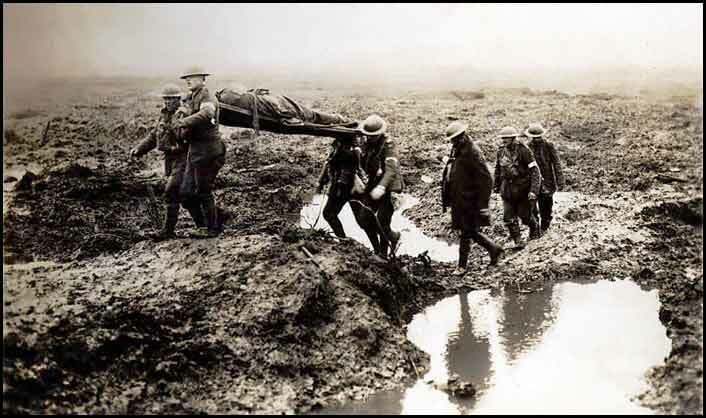 These lines carried the title: “In the fields of Flanders/Flanders Field”. Unfortunately, McCrae died from pneumonia on 28 January 1918. When the war was over, Moira Michael from Georgia, U.S.A. took the first initiative to wear the poppy as Commemorative symbol. Moira Michael bought and sold poppies to raise money so as to aid and financially assist former servicemen from the war. She then at the time worked in an American YMCA canteen. A French woman, Madame E. Guerin, Secretary of the French YMCA, met Moira Michael during a visit to New York and upon her return in France, decided to follow Michael’s example. By selling handmade poppies and using the proceeds Madame Guerin helped orphaned children from the former war zones in France. Following the example of Moira Michael the “American Legion” in 1920 decided to use the poppy as a symbol of remembrance. A year later the “British Legion” started with the sale of poppies. In Canada the poppy was officially accepted by the “Great War Veterans Association” later to be named The Royal Canadian Legion, in 1921. This after the example set by Madam Guerin and strongly influenced by the poem “Flanders Field” by John McCrae. The poppy, this small red flower has through the ages, not only remained the exclusive commemoration symbol for the 116031 fallen Canadians but also represents the fallen Americans-English-Pools-Australians-New Zealanders-French-Dutch-Belgians and many other countries, whose countrymen gave their lives for peace and freedom.